A town on the eastern boundary of Zebulun (Josh. xix. 12), but belonging to the domain of Issachar, and assigned to the Levites (Josh. xxi. 28; I Chron. vi. 58). It is the modern Deburich, an important strategic position at the foot of Mount Tabor and overlooking the entrance into the great plain of Esdraelon. It was here, perhaps, that Barak mustered his troops (G. A. Smith, "Hist. Geog. of the Holy Land," p. 394). From Josephus ("B. J." ii. 21, § 3) it is known that a Jewish garrison was placed here for the purpose of watching the plain. The name occurs in a slightly altered form in the Talmud (Neubauer, "G. T." p. 265). 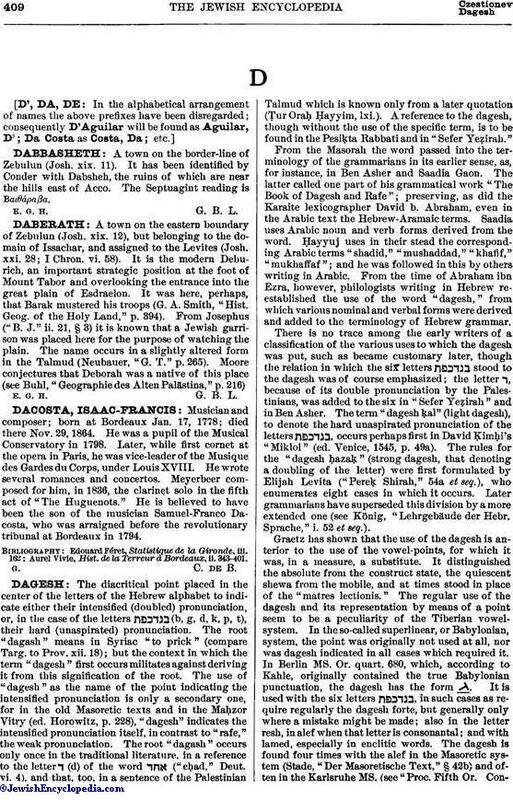 Moore conjectures that Deborah was a native of this place (see Buhl, "Geographie des Alten Palästina," p. 216).